We are one of the trusted name in the industry in offering a wide and comprehensive ranges of Seal Clip. All these items are supplied at a very low cost. 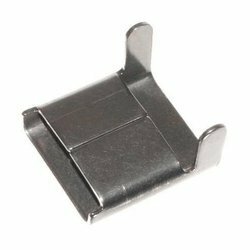 Being a customer-focused organization, we are engaged in offering a qualitative range of Aluminium Seal Clip. The offered range of wing seal is manufactured by our expert professionals using premium quality raw material and advanced technology. We offer wide and exclusive range of Tighten Seal Clip. All these Clips are manufactured using high quality raw materials. Seal clips are generally used for light gauge banding, like wires or pipe clamping. The wings are easily closed by general tools. These Seal clips are made by using high quality of raw materials which have been procured from well known vendors and these offer an excellent performance to the customers. Apart from this, these are offered at leading industrial prices. 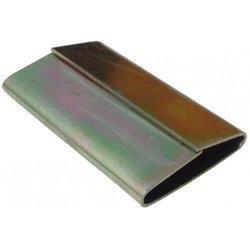 They are used to tighten steel bends on the outer surface of insulated pipes. 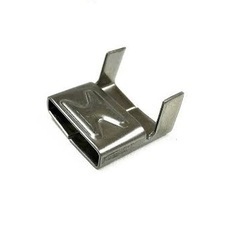 Being a customer focused organization, we are engaged in offering a qualitative range of Aluminium Wing Seal Clip. The offered range of wing seal is manufactured by our expert professionals using premium quality raw material and advance technology. These wing seals are widely for tighten steel bends on the insulated pipes outer surface. Stainless Steel Wing Seals/Clips are fabricated from high quality stainless steel to fit for the banding exactly that we offer. Wing seal clips are generally used for light gauge banding, like wires or pipe clamping. The wings are easily closed by general tools. Packing : 100 pcs to 1000 pcs per packet. Standard Sizes: 1/2" and 3/4"
Other Sizes: We make as per customer need. Price mention may vary depending order size. Keeping track with the market progress, we are devoted in providing our clients with top quality Toggle Latch. This product is designed by utilizing remarkable quality material and pioneering machinery in sync with set market standards. Our offered product is accessible in different industrial specifications as per the demands of our clients. Clients can get this range from us at market competent prices. 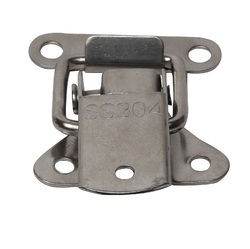 Stainless steel toggle clips / Latches are easy to install and remove, widely used in various incineration plant equipment, nuclear power insulation works, groove box, petrochemical insulation pipe valve boxes, jungle construction machinery, marine equipment, outdoor waterproof riot lighting, electrical boxes, valve boxes, furniture, equipment, toolbox Fixed connection. Stainless steel toggle clips / Latches are available upon Customers requirement. We are manufacturer of Stainless Steel and Aluminium Wing Seals. This seal banding is utilized for wires and pipes clamping. To assure high durability and better performance, we fabricate the provided wing seal band in sizes from 12mm -19mm in all desired thickness in SS grade 201, 202, 304, 316 or as per customer’s requirement. Further, high quality raw stainless steel is used for manufacturing such strong wind seals. The offered seal is also made available variety of sizes and dimension on business demands.